L 48″ (122 cm) W 84″ (213 cm). Description: Sexes similar. Flys with head drawn back. Adults large, stocky; silvery-brown to gray-brown above and below, with white head; large, black throat pouch. Immature similar but browner overall; lacks white on head and neck. Behavior: Often plunge-dives from heights of 20 to 50 feet to capture fish. 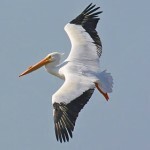 Habitat: Normally associated with coastal beaches and shorelines. Where in Nebraska: Possibly found around reservoirs, lakes and river oxbows and on sandbars during April and May. Rare casual spring visitor in Nebraska; hypothetical in the fall. 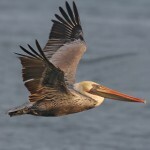 Status: The Brown Pelican population declined rapidly due to eggshell thinning and habitat loss; by 1970 the only viable population of Brown Pelicans existed in Florida. The population is now recovering on the east and west coasts. The species is still considered endangered in Texas and Louisiana. Fun Facts: Brown Pelicans incubate their eggs not by the warmth of their breast but rather by the webbing of their feet, essentially, standing on their eggs. As a result, the harmful effects of DDT made the unaware parents crush many of their eggs during incubation. 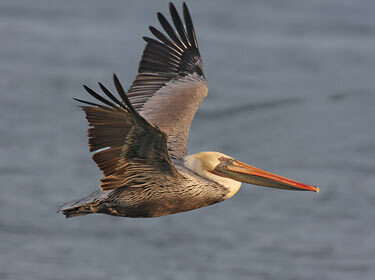 Brown Pelicans can live 25-30 years.